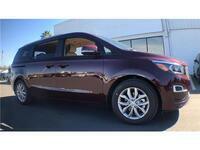 If you always thought minivans weren’t cool, then you’ve perhaps never been introduced to the Kia Sedona. 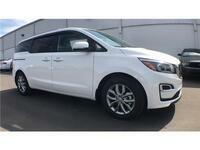 Loaded with the kinds of features large families need, the 2019 Kia Sedona in Crystal River FL offers a winning experience for everyone inside. You’ll have your choice of four different trims—L, LX, EX, and SX—so customization for your budget and preferences is easy. The L model seats seven people, while the rest of the Sedona lineup can fit eight people inside. Behind the third row in every Sedona, you can fit up to 33.9 cubic feet of cargo. For the biggest hauls, you can fold all third-row and second-row seats down and bring as much as 142 cubic feet of cargo along for the ride. If this already sounds perfect for your family, please click the link to review our current inventory; otherwise, continue reading for more of what you can expect with the 2019 Kia Sedona. Remote Keyless Entry with the L and LX models lets you open the doors with a simple push of a button, while the EX and SX models upgrade that to the even more convenient Smart Key w/ Push-Button Start and Immobilizer. Once inside, the driving experience will be enhanced with convenient steering wheel-mounted audio, hands-free phone, and cruise control buttons. The Bluetooth® Wireless Technology Hands-Free Connectivity functionality allows you to easily make and receive calls without having to hold your phone. All Sedona models come standard with a rearview camera to help give you an extra set of eyes while you are in reverse. The Sedona also offers Android Auto™ and Apple CarPlay™ compatibility with each trim, so no matter which smartphone operating system is your preference, you’ll be set. Speaking of phones, the EX and SX models come with a wireless phone charger for added convenience. The standard seven-inch touch-screen display in the L and LX models is upgraded to include SiriusXM®, while the SX model takes that to another level by increasing the size to eight inches and adding navigation and HDRadio™. Parents, if you’re looking to keep the kids entertained while on long road trips across the state or even the country, the available Dual-Screen Rear Seat Entertainment System in the EX and SX models can help. A built-in DVD player and device mirroring lets the kids enjoy their favorite movies and TV shows, which can help long drives go by in a flash. We’re just getting started with what the 2019 Kia Sedona in Crystal River FL has to offer. Please contact us if you are interested, and we can set up a test drive.